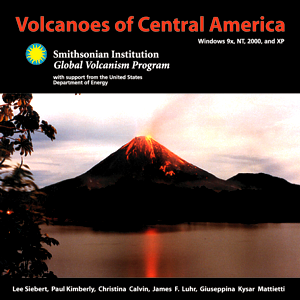 This CD-ROM contains an extensive compilation of data and images for the volcanoes of Central America. A map-driven interface allows selection of each of the 80 Holocene and 46 Pleistocene volcanoes of Central America. Users can view data about individual volcanoes, chronologies of known eruptions in the past 10,000 years, more than 950 images, over three decades of activity reports, and GVP's petrologic, bibliographic, and map databases. Runs on Windows 9x/NT/2000/XP. Also contained on this CD is Eruptions Through Time, a dynamic program that sequentially plots all known eruptions since 1960 on a physiographic map of México and Central America. Regional seismic data can be superimposed, along with tectonic-plate boundaries. Siebert L, Kimberly P, Calvin C, Luhr J F, and Kysar Mattietti G, 2006, Volcanoes of Central America (CD-ROM). Smithsonian Institution, Global Volcanism Program, Digital Information Series, GVP-7. These are no longer for sale, but a limited number are available free for personal or institutional use. Contact GVP by email using the link at the bottom of the page.